All teams that have 50 or more gymnasts (boys & girls) will receive a FREE 40 inch flat screen TV for attending the meet. ALL GYMNASTS AND COACHES WILL RECEIVE A FREE HOODIE FOR ATTENDING THE MEET! 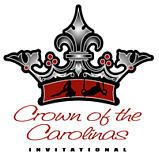 ALL GYMNASTS AND COACHES WILL RECEIVE A FREE CROWN OF THE CAROLINAS SWEATSHIRT JUST FOR ATTENDING OUR MEET. All teams that have 50 or more gymnasts (boys & girls) will receive a FREE 40 inch flat screen TV for attending the meet. 100% individual awards (all events and all around). 100% Team banners. A King or Queen of the Meet will be awarded to the gymnast with the highest AA for each session. Come join over 1800 gymnasts from all over the world at one of the best gymnastics meets. REFUND DEADLINE IS September 28th, 2018. $15 per person weekend pass. All NEW AAI Equipment provided by Thomas Gymnastics Meet Supply. Meet Addmission: $15 per person weekend pass.